Collier Hills is a historic residential neighborhood in Atlanta that rests on the border between Buckhead and Midtown. It is a desirable urban area that is rich in Atlanta history as well as lush landscape. The area enjoys three parks: Tanyard Creek, Ardmore, and Atlanta Memorial. It is conveniently close to shopping and restaurants along Peachtree Road, medical facilities around Piedmont Hospital, and AMTRAK rail service at Brookwood Station. Edgewood is a neighborhood located approximately three miles east of downtown Atlanta. This community offers a mix of eclectic charm with big city amenities, making it one of the most popular areas for in-towners that want a little of everything. Its easy proximity to downtown Atlanta, varied and beautiful housing stock, blossoming retail and entertainment sectors, and the diversity of its residents each contribute to its vibrancy as one of Atlanta’s earliest in-town “suburbs”. Grant Park is a 131-acre green space and recreational area and is the fourth-largest park in the city. The in-town neighborhood surrounding the park, is one of Atlanta’s oldest and most important historic districts. Together with Inman Park, Grant Park contains the largest remaining area of Victorian architecture in Atlanta. It is a mixture of the old and new residents with people of all levels of education, age, and racial backgrounds living in the same neighborhood. Inman Park is an in-town neighborhood on the east side of Atlanta. It is regarded as a highly desirable neighborhood with a mixture of rental and owner-occupied houses and condominiums. Almost all of the houses – both the mansions and the smaller dwellings – have been restored to their former glory, and the parks scattered throughout the neighborhood are well-maintained green spaces. Inclusivity and a strong sense of community have distinguished Inman Park. The neighborhood association has always welcomed renters and homeowners alike. A strong neighborhood association continues to fight for the betterment of the neighborhood, mostly financed by a three-day annual festival that brings thousands to Inman Park for food, music and a tour of the historic homes. Kirkwood is a national historic designated neighborhood on the east side of Atlanta. Downtown Kirkwood has become what neighbors call “the small town in the big city,” hosting its own post office, fire station, police precinct, and public library. 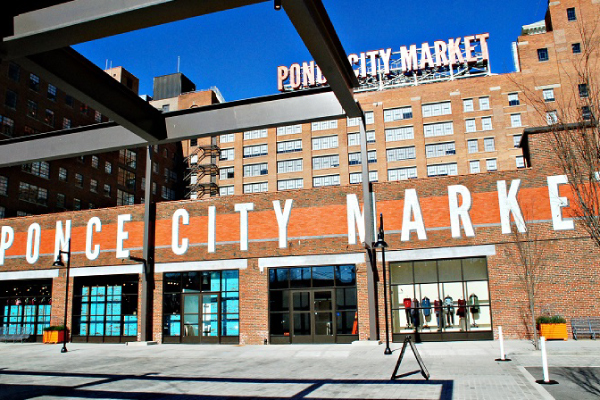 Residents and visitors also have a host of shopping and dining options at their disposal, as well as five of Atlanta’s public parks that are situated throughout the neighborhood. Kirkwood offers the perfect in-town living experience with friendly and diverse neighbors, strong sense of community, beautiful historic homes, mature trees, many parks, and a central location. Little Five Points (AKA “L5P” or “LFP” or “Little Five” or “Lil’ Five”) is a district on the east side of Atlanta. Five Points is a commercial district in the center of Atlanta and Little Five Points describes the area around its central intersection. It has been described as a melting pot of sub-cultures, is renowned for its alternative culture, and is often said to be the largest bohemian shopping area in the southern United States. This district is one of Atlanta’s best neighborhoods for viewing street art and is home to several yearly celebrations like the Little Five Points Halloween Festival and the Little Five Fest, which is an annual music festival featuring an array of local bands. Morningside is a quaint and prosperous community hidden between historic oaks and shady parks. You may almost forget you are in the middle of a big city; however, Morningside is one of the most thriving areas in Atlanta.With approximately 3,500 homes in the neighborhood, Morningside houses many families looking to be close to intown action, while still holding onto a bucolic way of life. Within walking distance to numerous restaurants, shops and award winning schools, you will find a combination of the ease of walkability and the comfort of a close-knit neighborhood. Old Fourth Ward (AKA “O4W” or “OFW”) is a historic neighborhood in Atlanta. Located just east of downtown, Old Fourth Ward is the birthplace of America’s best-known civil rights leader, Dr. Martin Luther King, Jr. In recent years, O4W has continued to evolve and redefine itself. One big asset to the area has been the proximity to Freedom Parkway and the Atlanta BeltLine, which has inspired growth and community investment. An example of this growth is the Historic Fourth Ward Park. This park encompasses 17 acres of new green space, a two-acre lake, playground, a state-of-the-art splash pad, an outdoor theater, athletic field and a world-class skate park. With great amenities including Krog Street Market and Ponce City Market, a quick trek down the Beltline, and some of Atlanta’s top restaurants, it’s easy to see why Old Fourth Ward is one of Atlanta’s top neighborhoods. Virginia-Highland (AKA “VaHi”) consists of four distinct commercial “villages” connected by short, walkable blocks lined with charming bungalow homes. The neighborhood’s name derives from the intersection of Virginia and Highland Avenues and has the feel of a small town within the heart of the city. Virginia-Highland is acclaimed for its diverse and unique shopping and also caters to those seeking solace in the city. The neighborhood is famous for its bungalows and other historic houses from the 1910s to the 1930s. It has become a destination for people across Atlanta with its eclectic mix of restaurants, bars, and shops and for the Summerfest festival, annual Tour of Homes, and other events.